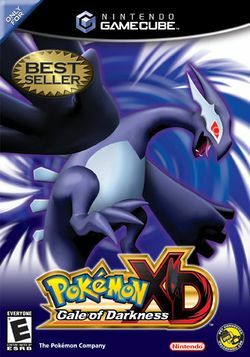 Pokémon XD: Gale of Darkness, released in Japan as Pokémon XD: Yami no Kaze Dark Lugia, is the second console role-playing game from Nintendo’s Pokémon franchise for the Nintendo GameCube. It is the successor of the GameCube game Pokémon Colosseum. The game takes place in Orre, the setting of Pokémon Colosseum’s adventure mode. All of the Game Boy Advance Pokémon games can connect to this game through trading and Battle Mode. This page was last edited on 8 September 2015, at 15:58. This page has been accessed 28,850 times.